When 24 star Annie Wersching, 32, was digging for worms as a young girl at her grandparents’ lakeside home, she had no clue how down-and-dirty her life would become. Last year she found out. Wersching’s character, FBI agent Renee Walker, was buried alive on the hit series. She survived this peril, as well as chilling temperatures while filming scenes in the 53° Potomac River, and hand-to-hand combat with the bad guys. She’s also tortured terrorists and held her own against star Kiefer Sutherland’s no-nonsense Jack Bauer. Not bad for a petite gal with a degree in musical theater who spent most of 2007 emoting from the neck up as vengeful TV-host Amelia Joffe in the daytime soap General Hospital. The fair-skinned stunner spent her formative years playing sports and dazzling audiences as a member of a high-octane Celtic dance troupe. The latter experience taught her balance, rhythm, endurance and coordination—not to mention how to play a fight scene. And her mom encourages the on-the-go actress to eat high-protein, veggie-rich meals to keep her strong and energized for long days of emotionally—and often physically—rigorous shooting. 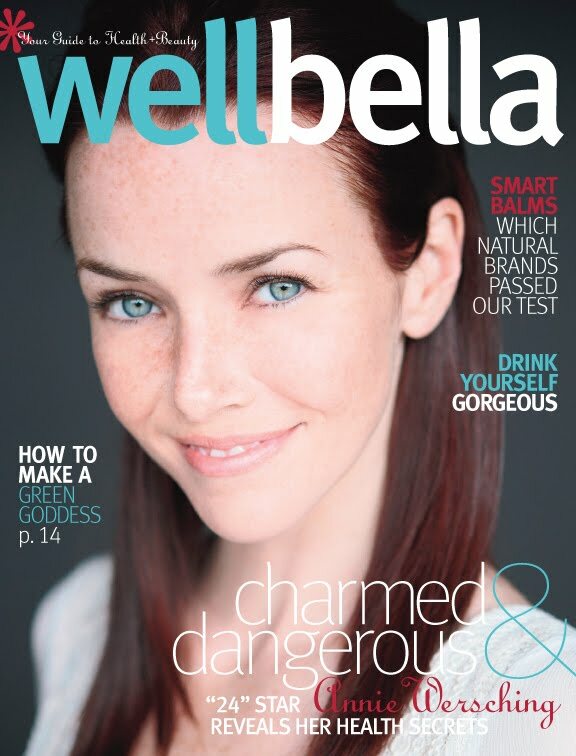 Here, the freckle-faced actress talks to WellBella about her healthy habits (and occasional indulgences). WellBella: I’ll bet filming “24” is pretty strenuous. How long is a typical day? Annie Wersching: It varies, depending on what kind of day we’re shooting. Ten- to 12-hour days are typical. A 14-hour day for us is a pretty big day. There are two different kinds of big days. If it’s a really big action day—like on location or with stunts, any of that stuff—that’s one form of strenuous. Then another kind of day is when we have really intense dialogue or really emotional stuff. The action-filled, shoot-’em-up, flip-car days are usually, I think, easier than a big emotional day. I love all the stunt stuff. WellBella: Does your background make you game for the fight scenes and for being exposed to the elements? Annie Wersching: I was an Irish dancer growing up, and I played tennis and softball. I was always the girl who was climbing the tree for the farthest branch—that kind of stuff. I was a bit of a tomboy, but not an overboard tomboy. I always loved being out in the wilderness. My grandparents had a house on the lake just outside St. Louis. It was fun to dig for worms with my grandpa. I guess that kinda’ stuff got me ready for this role. WellBella: So you’re not worried about breaking a nail? Annie Wersching: I loved those days on the show when they buried me alive, and I had dirt and blood all over me. I love anything that I get to do that I would never do in my normal life, like standing on the edge of an SUV and firing a gun while trying to drive. Once-in-a-lifetime experiences—I just love ’em. WellBella: How did Irish dancing prepare you for the combat choreography? WellBella: What are your strongest body parts? WellBella: How does a rough-and-tumble terrorist tracker keep her energy up? Annie Wersching: The biggest thing for me is sleep. In general, if I don’t get enough sleep, I do not function well. There was a scene last year where I slapped Jack Bauer. I was really nervous about it. I knew she had to be kind of raw and intense. I barely slept at all the night before—almost on purpose, because I knew it would help fuel the rawness of her. I’ve only done that once or twice, though. Also, I take a women’s multivitamin every day. And last year I started taking omega-3 fish oils. Annie Wersching: I moved my mom out to California about two years ago. She lives next door to me now, so Mom’s home cooking helps. She’s very good about food: “Make sure to eat your vegetables! Put color on your plate.” And she makes this amazing thing called turkey scramble with spinach and turkey. WellBella: Are there healthy snacks on set? Annie Wersching: It’s pretty much a little bit of everything on a TV set. But the guy that we have is really great at having a huge supply of organic food, including the most amazing organic fruit. And he makes chicken salad on the catering truck that’s to die for. But there are also the most amazing cookies you’ve ever seen, so you just have to watch it. WellBella: “24” and other FOX productions are now “eco-friendly.” Has that affected your daily life? Annie Wersching: Oh yeah. We don’t get hard copies of scripts any more. At first I was like, “Um, am I supposed to memorize this on my computer?” But it’s turned out great. 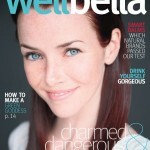 WellBella: How do you protect your fair skin when shooting outside? WellBella: How often do you hit the gym? Annie Wersching: I go through kicks where I’ll be really intense at the gym for, like, three weeks. Cardio on the elliptical machine makes me feel amazing. Then I won’t go a few days, and then it’s like, you just cannot get back. But you know you’re gonna feel good once you do. You don’t realize till afterward how good a sweat makes you feel. Annie Wersching is an actress best known for Renee Walker on 24. This is the most comprehensive Annie Wersching resource on the web with the largest collection of pictures, videos, interviews, latest news, and more.